The remnants of a stone house sit about 20 kilometres northwest of Naujaat. The structure has maintained its outline; a single wall is left intact while the rest of its stones are scattered around the site. It’s a small site that tells a much bigger story. This is the John Rae house, built by the Scottish explorer of the same name and a crew who travelled though the region in 1854 in search of the Franklin expedition, which had left England nine years earlier. A plaque installed at the stone house by the territorial government years ago identified the home’s original builder for Inuit in nearby Naujaat, though the story of Rae’s trek has remained relatively unknown in the Kivalliq community. 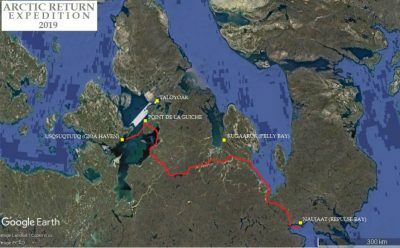 To mark the 165th anniversary of Rae’s trip—which discovered Inuit oral evidence revealing what happened to the doomed Franklin expedition—a Scottish-Canada crew known as Arctic Return is embarking on the same trek to retrace the group’s steps. 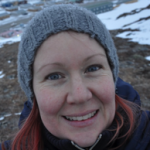 “Nobody in town really knew about the John Rae expedition before,” said Laimmiki Malliki, a cultural teacher at Tuugaalik school in Naujaat. 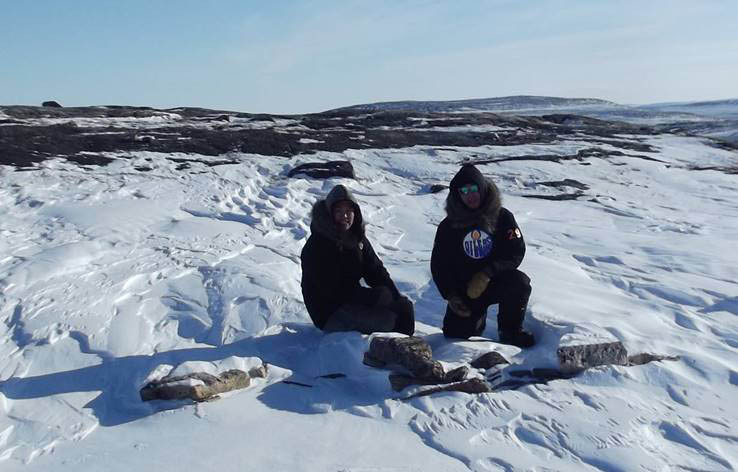 Drawing on Malliki’s vast knowledge of the surrounding area, the Arctic Return crew approached Malliki and two other local guides—Jerry Nuluk and David Nimiqtaqtuq—to help them map the 650-kilometre trek from Naujaat across the Boothia Peninsula to Rae Strait. That’s the open channel to the east of King William Island, which Rae and his crew are credited as being the first outsiders to discover. The Arctic Return expedition is led by the Scottish-born, Nunavut-based guide Dave Reid and handful of other travellers, including a filmmaker. The group left Naujaat late last month with their guides and five local high school students, who accompanied the group as far as the Rae stone house. Rae employed Inuit guides on his trip in 1854, though they were from a different region of the Arctic. But the success of his expedition is largely credited to the crew’s ability to understand and live off the land. Arctic Return’s crew is two weeks into a 40-day, 650-kilometre trek between Naujaat and Gjoa Haven, tracing the steps of John Rae’s 1854 expedition. Laimmiki said some of the Arctic Return crew have travelled in Nunavut before, but none in this particular region. He worried they may not be well-equipped with their freeze-dried food and tents. “They have to adapt to the Inuit way to do a trip like this,” he said. While the spring days grow longer, the temperature in the western Arctic still hovers between -20 C and -30 C.
The trip to Gjoa Haven is expected to take about 40 days. Already one crew member has been pulled from the expedition due to an ankle injury. Many historians who study Arctic exploration say that Rae never received the accolades he deserved. His discovery was controversial; not only did Rae confirm the demise of the Franklin expedition and its crew, he reported back to the British Admiralty that some crew members had resorted to cannibalism in their final days, based on testimony he gathered from local Inuit. Sir John Franklin’s wife and novelist Charles Dickens then pushed a narrative that local Inuit or “savages” had actually killed the crew, which wasn’t challenged for decades, until forensic research confirmed that cannibalism had indeed taken place. Arctic Return plans to document its journey by film and eventually in a book. The group hopes to gather support from their expedition to restore Rae’s family home in Orkney, off Scotland’s northern coast, into an Arctic interpretive centre. A very interesting documentary about Rae’s expedition and impact was made in 2008 by John Walker, Passage, Really worth seeing! During a trip through Stromness in the Orkney Islands, my partner and I stumbled upon a small museum, which along with the usual display naval paraphernalia and model ships related to the sinking of the Germany’s World War 1 fleet at Scapa Flow had a whole section focused upon Rae and his arctic journeys. The museum has his journals, clothing, photographs and drawings. Rae was a proud Orcadian and donated all his arctic mementos to the museum upon his death. The Orkneys are very beautiful and well worth a trip as is a visit to this museum in Stromness.